Whether you’re wondering what style of décor to use in the nursery, what parent-child activities are currently hot right now, or which new parenting methods are taking over, below you’ll discover all of the hottest trends you may want to follow this year. It appears 2017 is the year parents are starting to say goodbye to processed, sugary treats. There’s much more of a focus these days on healthy eating. Childhood obesity levels have made parents start to think more about what they’re feeding their little ones. Plus, there’s the additional benefit that less sugar equals calmer children! So, what homemade goodies are parents cooking up? Homemade popsicles appear to be one of the leading treats parents are creating. Packed full of delicious goodness, you can get really creative with the flavors. They’re also fantastic for the hot, summer months so this is one trend you can get started on right away. Kids today are a lot savvier with technology than some adults! Thanks to the internet and advancements in technology, children these days are becoming really clever. Now, it seems parents are keen to give their little ones a head start in life by helping them to become bi-lingual. Generally speaking, it’s best to start teaching your little one a new language when they’re around two and a half years old. French and Spanish are particularly popular and it’s much better to use the help of a native speaker, rather than relying solely upon the internet or language apps. There are a lot of nursery themes taking over in 2017, but the main one appears to be woodland themed décor. Magical trees, forest animals and earthy tones give a really calming, adventurous theme to the nursery. What’s more, it’s a great gender neutral theme that will suit any child. Another upside of this kind of theme is that you won’t need to change it anytime soon. As your child ages, the woodland theme will still be considered trendy and suitable for many years to come. In recent years, parents have felt a lot of pressure to be able to do it all. However, many are now starting to realize the importance of taking a step back and slowing down the pace. So, there’s a focus on having plenty of “me time” and taking care of your mental health, as well as ensuring your children aren’t becoming overwhelmed by the fast-pace of life. One particular wellness trend that’s taking off this year is yoga and mindfulness. The latter teaches you how to slow things down and enjoy being in the moment. There’s been a worrying shift in recent years which has seen children spending more time in front of a screen than outdoors playing. Technology is a wonderful thing, but it’s easy to overuse it. Parents are starting to take notice of the potential problems which come from too much screen time. Encouraging your little one to get out into the garden and to play with their friends is going to have a significant positive impact on their development. Speaking of playtime trends, another one that’s really taking off is creative play. Arts and crafts are becoming especially popular, as you’ll clearly see on sites such as Pinterest. Finger puppets, homemade cards and season related crafts are just some of the activities parents are using to encourage their child’s imagination. One of the more unique parenting trends of 2017 is a bunch of new baby names that weren’t used much before. There’s been a major shift from traditional, common names to more unique names. In particular, parents are favoring names of planets, wild animals and gods. So, if you’re expecting this year, you may want to start thinking about what unique and wonderful names you could give your little one. Parents are now starting to turn to essential oils in order to calm their kids down. Lavender is one of the most commonly used essential oils for kids and it can have great benefits if used correctly. Be aware that not all essential oils are suitable to be used on children. So, it’s a good idea to do your research before you start dabbling with essential oils. We have an article published on essential oil use with babies that you can read by clicking here. How do you feel about breastfeeding your little one until they are 2-3 years old? Well, apparently, this is a growing trend that is said to have plenty of benefits for both you and your child. It’s something that’s widely done in countries such as India, but in the Western world, breastfeeding past the age of one tends to be frowned upon. Whether or not this trend will last long remains to be seen, but it is gathering more momentum with each passing year. More parents than ever before are starting to embrace a relaxed parenting style. This means giving their little ones more choices and resisting stepping in too much. This is perhaps one of the most difficult trends to follow, as it’s a natural instinct to want to protect your child and do things for them. However, if you can learn to let go, just a little, you’ll be amazed just how much happier you and your little one can be. While no parenting style will work for every child, more and more parents are trying this one out in 2017 and finding positive results from doing so. 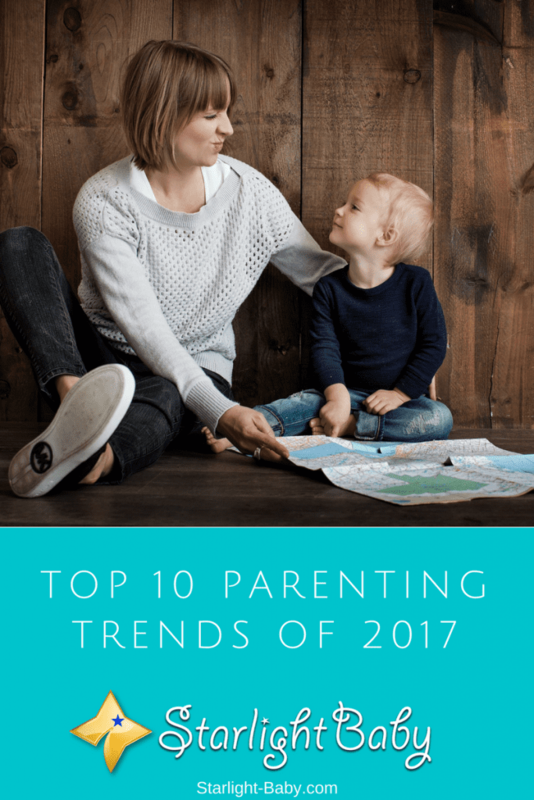 Overall, there’s a lot of parenting trends floating about this year, but the 10 above are the most popular. Of course, you don’t have to follow somebody else’s trend. Why not set your own? Share your 2017 parenting tips below! Actually, this is what parents should do so as to relate well with their kids. I enjoyed reading these tips for it will help me become a better parent in the future. Great to know the tips will help make you a better future parent. We really need a lot of responsible parents in the future with the kind of bad behaviors shown by young generations these days. I do believe everything boils down to good parenting. If kids are not properly disciplined and taught, we get disrespectful and irresponsible future teens and adults. And when we grow old, these teens and adults will be the ones deciding our future. I personally agree with these 10 parenting trends in 2017. Childhood obesity is very common nowadsys. Longer breastfeeding helps alot rather than dealing with formula milk. Outdoor play is essential for kids growth, this serves as exercise and develop social and intellectual development to them compared of using gadgets. Most of the international school is required to have second language usually they offer Mandarin, French and Spanish. This generation is highly competitive so we as parents needs more wide array of understanding, support and balanced discipline to our young ones. Truly, we need to encourage kids to spend more time outdoors so they can develop their creativity and imagination, and their strength because of the physical exercise they get from outdoor play. And you’re right regarding the young generation these days as highly competitive. We do need to re-think our child-rearing practices and adapt to changes as well. Parent-child relationship should be made to be lively and fun because it necessitates the bonding well of the family. It makes the child always comfortable being around the parents as well as the parents with the kids. Among the trending names I have heard which I love so much is Thea. The sound of it is intriguing to me. In this fast-paced life, family bonding is often sacrificed because of the parents’ work needs and children’s school needs. When they get home, both are almost always exhausted. It would be great if families could set aside time to get away from their busy lives even for just a few days. It would be wonderful for the whole family. Good family relationships are important. It should not be taken for granted.